I *love* treemaps. 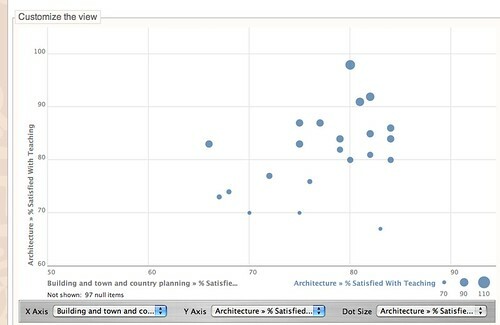 If you’re not familiar with them, they provide a very powerful way of visualising categorically organised hierarchical data that bottoms out with a quantitative, numerical dimension in a single view. 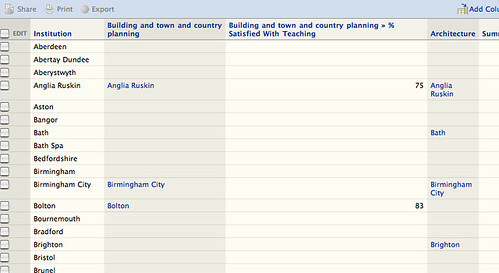 For example, consider the total population of students on the degrees offered across UK HE by HESA subject code. 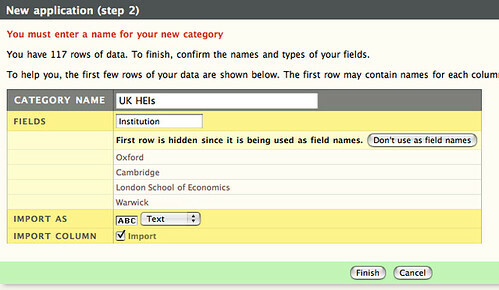 As well as the subject level, we might also categorise the data according to the number of students in each year of study (first year, second year, third year). Instead, what I will show is how to visualise data from a sports championship, in particular the start of the Formula One 2011 season. This championship has the same entrants in each race, each a member of one of a fixed number of teams. Points are awarded for each race (that is, each round of the championship) and totalled across rounds to give the current standing. As well as the driver championship (based on points won by individual drivers) is the team championship (where the points contribution form drivers within a team is totalled). I’m not certain, but I think the Many Eyes treemap algorithm populates the map using a sorted list of summed numerical values taken through the hierarchical path from left to right, top to bottom. Which means top left is the category with the largest summed points. If this is the case, in the above example we can directly see that Webber is in fourth place overall in the championship. We can also look within each blocked area for more detail: for example, we can see Hamilton didn’t score as many points in Malaysia as he did in the other two races. 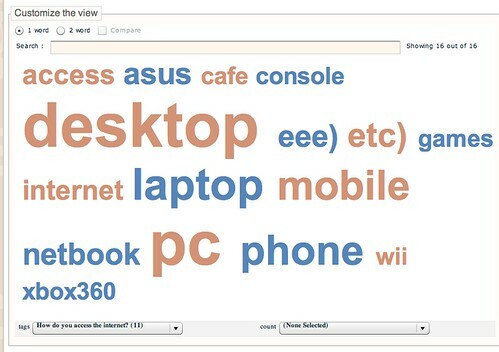 What might be interesting would be to feed Protovis or the JIT with data dynamically form a Google Spreadsheet, for example, so that a single page could be used to display the treemap with the data being maintained in a spreadsheet. PS see also More Olympics Medal Table Visualisations which includes a demonstration of a treemap visualisation over Olympic medal standings. 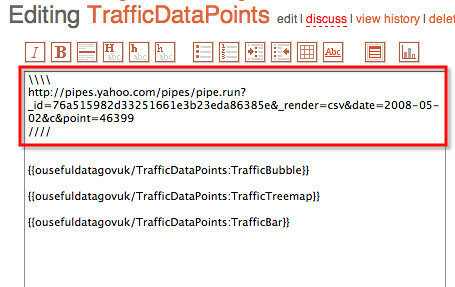 In a couple of posts last year (Hackable SPARQL Queries: Parameter Spotting Tutorial and First Dabblings With Pipelinked Linked Data) I started to explore how it might be possible to use Yahoo Pipes as an environment for sharing – and chaining together (albeit inefficiently) – queries to the data.gov.uk open transport data datastore. 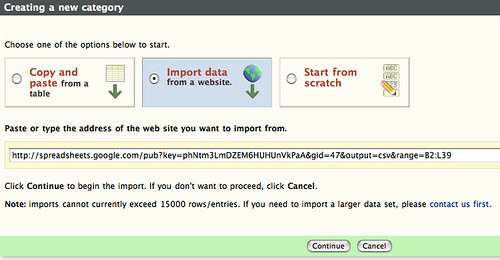 Those posts concentrated on querying the datastore in order to find the location of traffic monitoring points according to various search criteria. In this post, I’ll show you one way of visualising traffic count data from a traffic count point using Many Eyes Wikified. Do you spot anything about traffic flow going North versus South at 8am compared to 5pm? 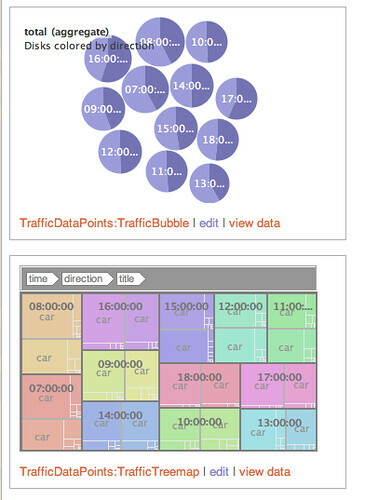 This shows us the relative counts for different vehicle types, again by time of day. Notice the different distribution of van traffic compared to car traffic over the course of the day. 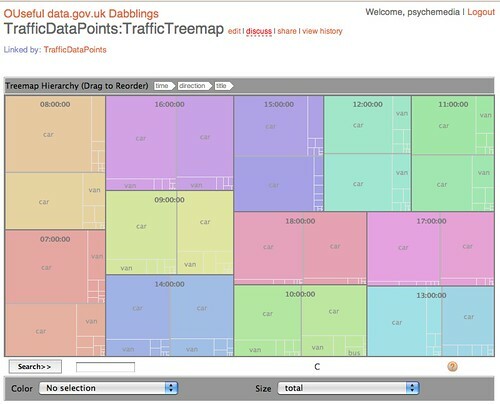 One thing that jumps out at me from the treemap is how symmetrical everything seems to be at noon?! 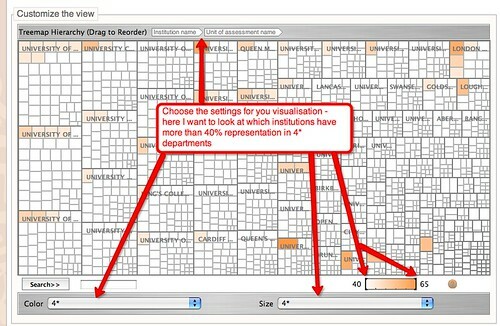 All the above visualisations are interactive, so click through on any of the images to get to the interactibve version (Java required). 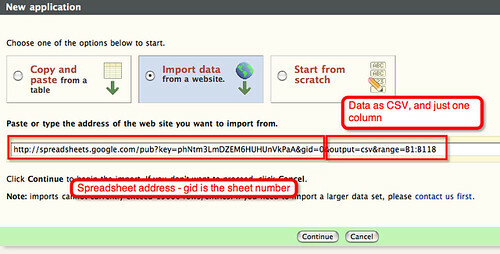 As to how to find traffic monitoring point IDs – try this. 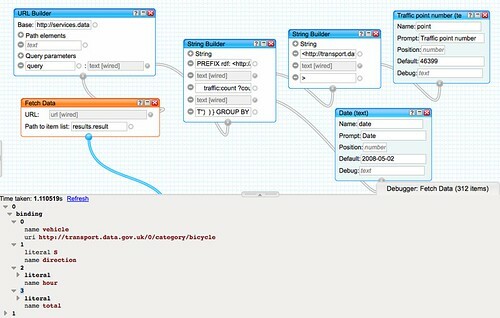 PS a disadvantage of the above recipe is that to generate a visualisation for a different traffic point, I’d need to use the desired parameters when grabbing the CSV feed from the pipe, and then create new Many Eyes Wikified data pages and visualisation pages. However, using nothing more than a couple of web tools, I have managed to prototype a working mockup of a visualisation dashboard for traffic count data that could be given to a developer as a reference specification for a “proper” application. 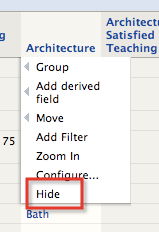 And in the meantime, it’s still useful as a recipe… maybe? One of the, err, side projects I’ve been looking at with a couple of people from the OBU has been bouncing around a few ideas about how we might “wrap” coverage of Formula One races with some open educational resources. First off, where to get the results info? 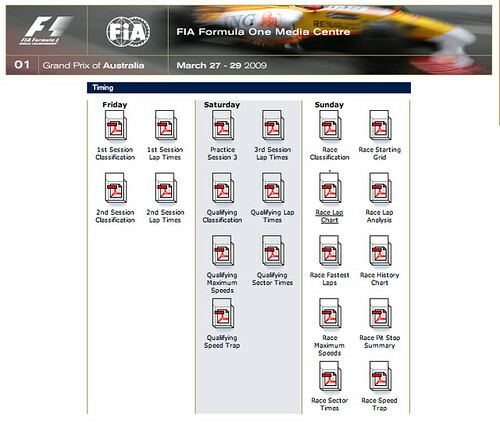 An API source doesn’t seem to be available anywhere that I’ve found as a free service, but the FIA media centre do publish a lot of the data (albeit in a PDF format): F1 Media Centre – Melbourne Grand Prix, 2009. For convenience as much as anything, I thought I’d use Many Eyes Wikified to produce a set of visualisations based on the lap time data and the race lap chart. 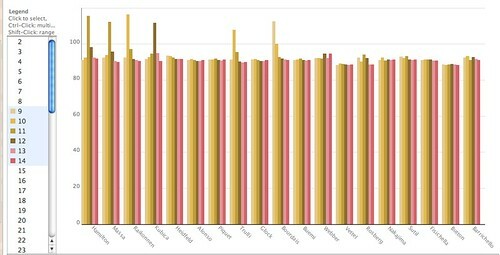 To get the data into an appropriate form required a little bit of processing (for example, recasting the race lap chart to provide the ranking per lap ordered by driver) but as ever, most of the charts fell out easily enough (although a couple more issues were raised – like being able to specify the minimum y-axis range value on a bar chart, for example). 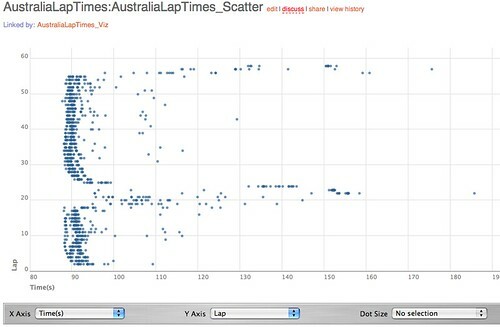 Anyway, you can find the charts linked to from here: Australia Lap Times visualisation. In the meantime, here are some examples (click through to reach the interactive original). There are a few more data sets (e.g. pitting behaviour) that I haven’t had a look at yet, but if and when I do, I will link to them from the Australia Lap Times visualisation page on Many Eyes Wikified. PPS It’s now time for the 2010 season, and this year, there’s some Mclaren car telemetry data to play with. 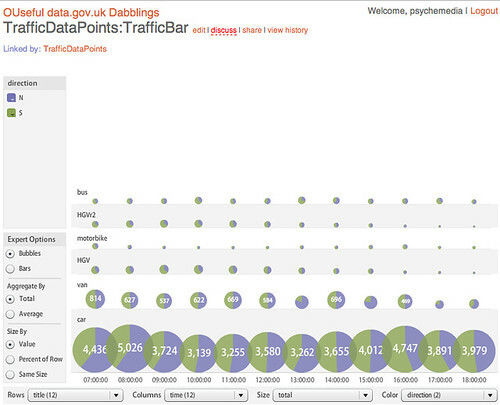 For example, here’s a video preview of my interactive Mclaren data explorer. 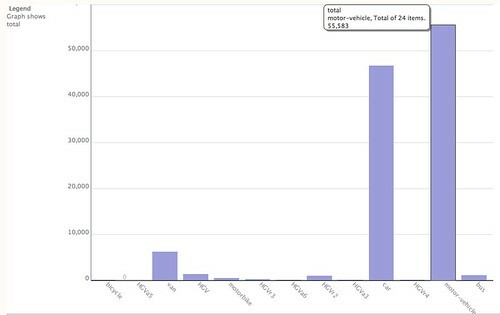 Last week, I posted a quick demo of how to visualise data stored in a Google spreadsheet in Many Eyes Wikified (HEFCE Grant Funding, in Pictures). 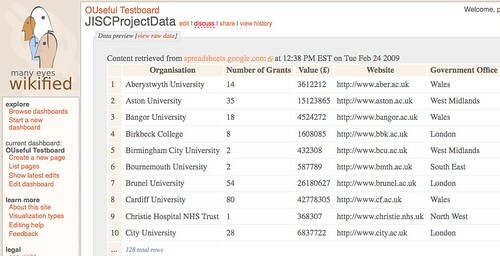 The data I used was the latest batch of HEFCE teaching funding data, but Joss soon tweeted to say he’d got Research funding data up on Google spreadsheets, and could I do something with that? 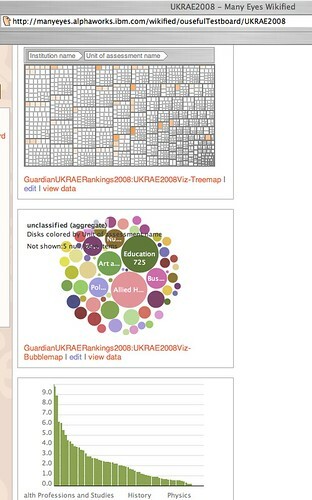 You can see the results here: Visualising UK HEI Research Funding data on many Eyes Wikified (Joss has also had a go: RAE: UK research funding results visualised). 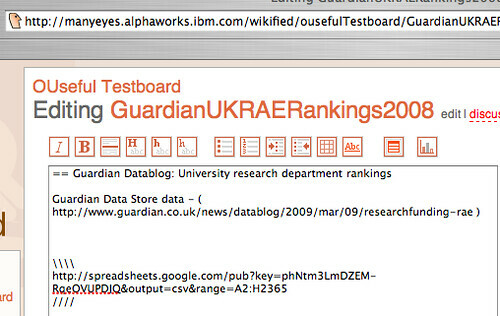 Anyway, today the Guardian announced a new content API (more on that later – authorised developer keys are still like gold dust), as well as the Guardian data store (strapline: “facts you can use”) and the associated Data Store Blog. 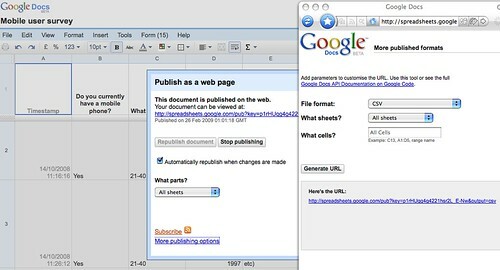 Interestingly, the data is being stored on Google docs, in part because Google spreadsheets offer an API and a wide variety of export formats. As regular OUseful.info readers will know, one of the export formats from Google spreadsheets is CSV – Comma Separated Variable data – which just so happens to be liked by services such as Dabble DB and Many Eyes. 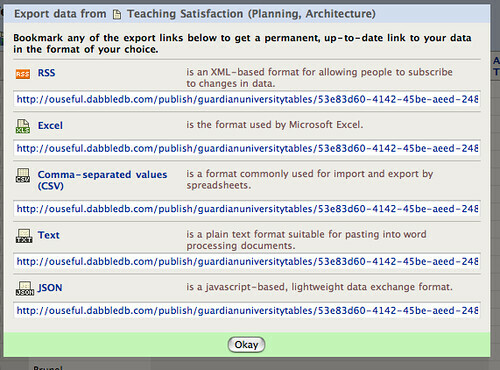 I’ll try to come up with a demo of how to mash-up several different data sets in Dabble DB over the next few days, but as I’ve a spare half-hour now, I thought I’d post a qiuck demo of how to visualise some of the Guardian data store spreadsheet data in Many Eyes Wikified. 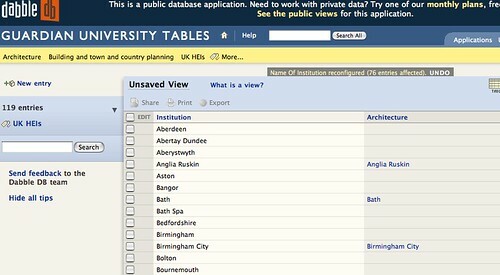 So to start, let’s look at the the RAE2008 results data – University research department rankings (you can find the actual data here: http://spreadsheets.google.com/pub?key=phNtm3LmDZEM-RqeOVUPDJQ. (Note this “crap” is actually important metadata – it describes the data and its provenance – but it’s not the actual data we want to visualise). Grabbing the actualt data, without the metadata, can be achieve by grabbing a particular range of cells using the &range= URL argument. 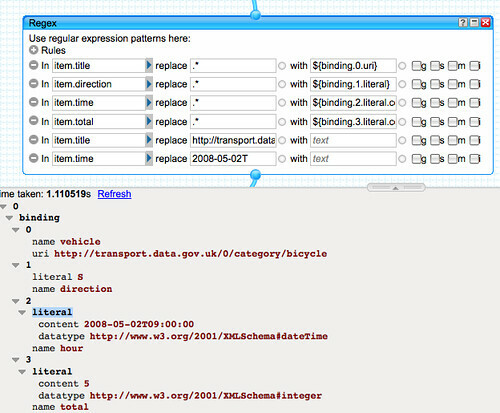 Inspection of the table suggests that meaningful data can be found in the columnar range of A to H; guesswork and a bit of binary search identifies the actual range of cell data as A2:H2365 – so we can export JUST the data, as CSV, using the URL http://spreadsheets.google.com/pub?key=phNtm3LmDZEM-RqeOVUPDJQ&output=csv&range=A2:H2365. 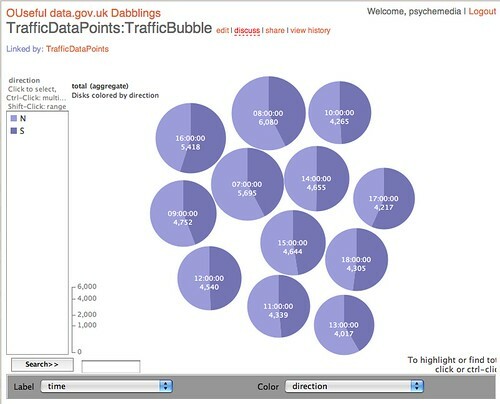 See more examples here: RAE 2008 Treemap; RAE 2008 Bubble Diagram; RAE 2008 bar chart. A couple of weeks ago, I posted a workaround for Creating Your Own Results Charts for Surveys Created with Google Forms. With the release of Many Eyes Wikified, it’s now possible to power Many Eyes visualisations from online data (e.g. 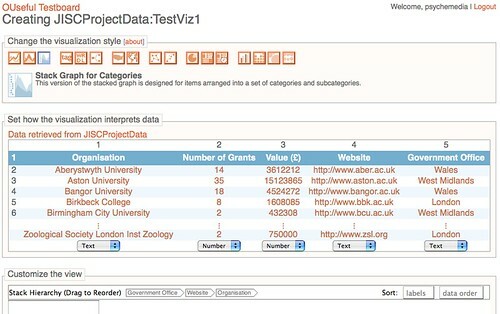 as described in Many Eyes Wiki Dashboard – Online Visualisation Tools That Feed From Online Data Sources). 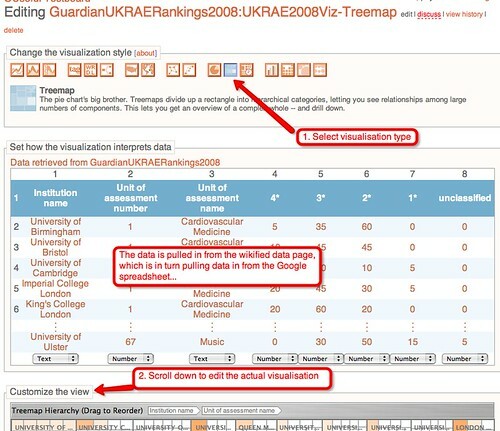 So I was wondering – would it be possible to just pull data from the results spreadsheet for a Google form, and visualise it directly in Many Eyes without having to do any results processing on the spreadsheet side? 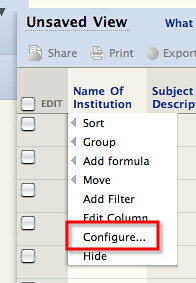 Firs step – find a form. 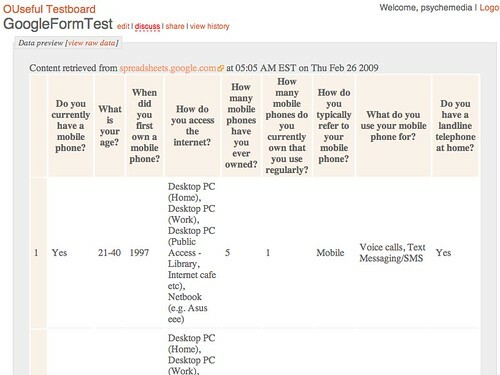 I created a test one some time ago doodling ideas for a mobile survey form which contains some data, so that’s a start: Demo Mobile User Form. Hmm – Many Eyes Wikified doesn’t see the columns…??? Unfortunately, in many of the chart types, there doesn’t seem to be the ability to plot a count of particular results(?). 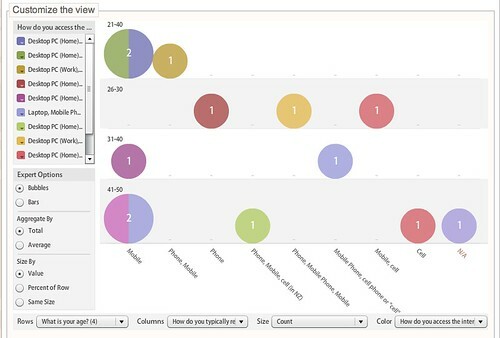 For example, in the bubble chart, I can’t seem to plot bubble size as a count of the results in each results category? (Would I expect to be able to do that…? Hmmm… I think so…?!) 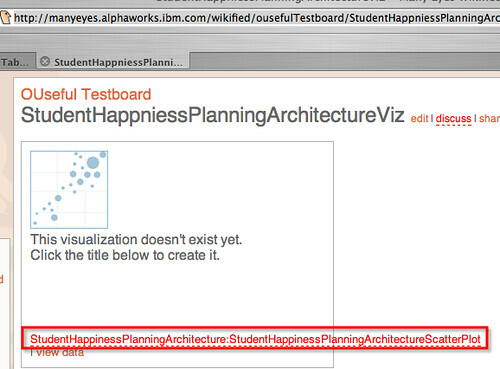 Instead, I can only plot size according to data values in one of the numerical columns? 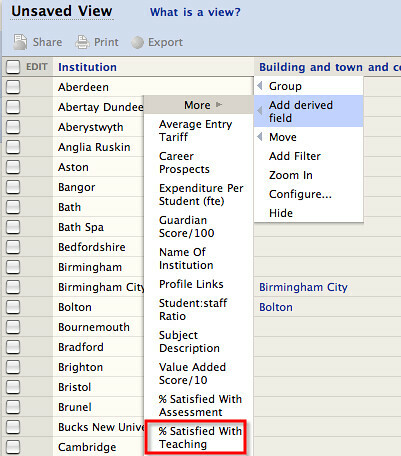 In many cases, in order to plot sensible visualisations that process and display the form results data, I need to be able to count the occurrence of different results classes within a results column. 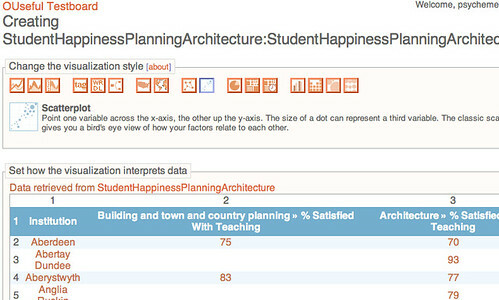 A count option is available in the Matrix chart, but not in many of the other visualisation types? 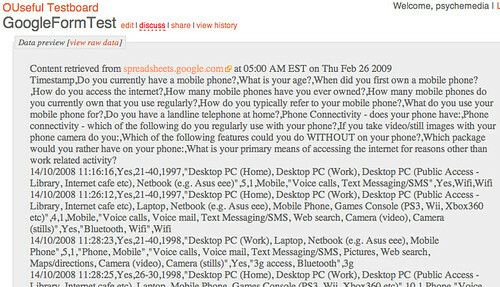 There’s also the issue that many of the results contain multiple items; so for a example, in answer to the question “What do you use your mobile phone for?” we might get the answers Voice calls, Text Messaging/SMS, Web search, Maps/directions, Camera (stills) (selected from a drop down list on the original form). 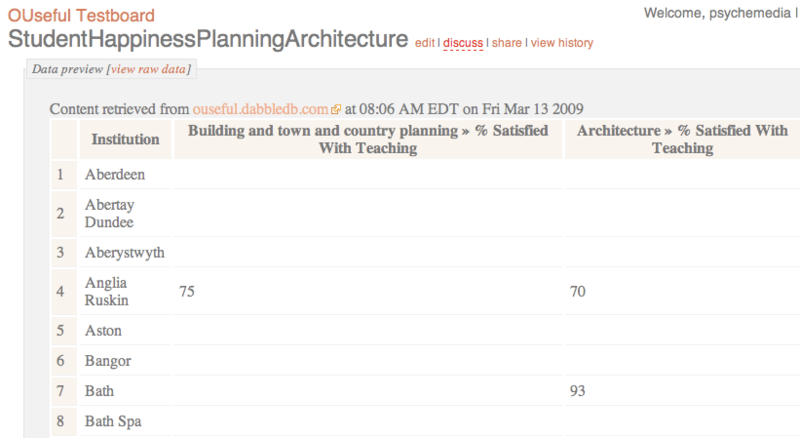 What would be really nice would be the ability to specify a delimiter/separator to split out the different results in a particular column, then let Many Eyes enumerate the different possible answer choices in that column, and count on each one. 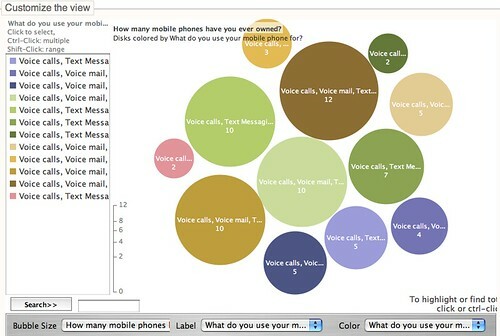 So for example, I’d like to select a bubble chart based on the column “What do you use your mobile phone for?” and have Many Eyes identify the different segments, (Voice Calls, Web Search etc), count the occurrence of each of those and plot each segment as a bubble, with size proportional to the counted occurrence of the segment in the results. 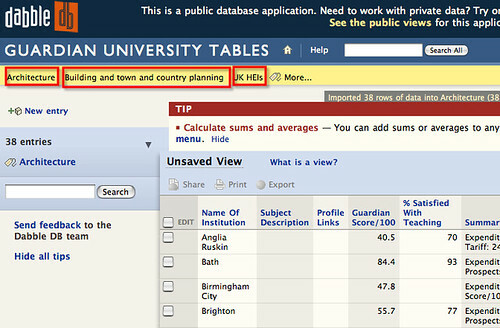 In the meantime, I suppose it’s always possible to process the results in the spreadsheet as demonstrated in Creating Your Own Results Charts for Surveys Created with Google Forms and then just export the CSV of the particular question results tables to Many Eyes Wikified? 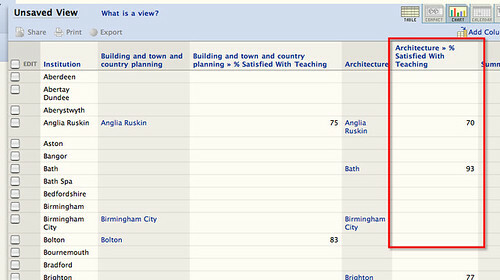 Or alternatively, design questions that work nicely when the raw results are passed to Many Eyes Wikified? Aren’t blog comments wonderful things? 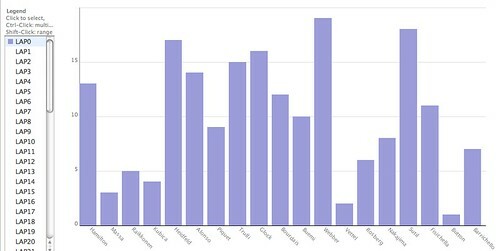 Today, I learned from a comment by Nicola on Visualising Financial Data In a Google Spreadsheet Motion Chart that Many Eyes can now be used to visualise live data via Many Eyes Wikified. Many Eyes Wikified is a “remix” of Many Eyes, using a wiki markup syntax to enable you to easily edit datasets and lay out visualizations side-by-side. It also functions just like a normal wiki: you can collaboratively edit pages, add explanations or documentation to your visuals, see a page’s edit history, and revert changes. 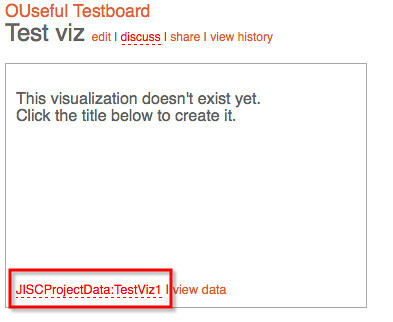 Unlike a normal wiki, you can embed content from your blog or other data source within Wikified and visualize it. 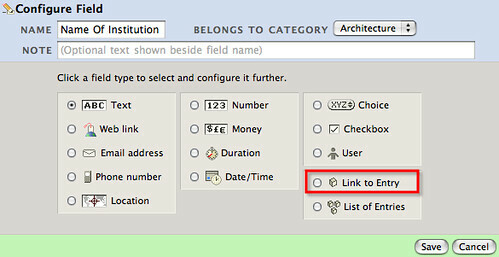 You can also embed the content you make in Wikified elsewhere, just like you can in Many Eyes. 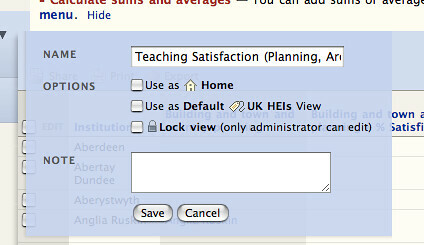 First up, you can add data to a page by simply copying and pasting a CSV table into it. So far, so Many Eyes – except that the page where you paste your content is actually a wiki page – so you can have all sorts of explanatory text in the page as well. What’s really useful, though – and something I’ve been wanting for some time – is the ability to pull live data into the wiki page from another online source. So far I’ve only tried pulling in CSV data from a Google spreadsheet, but as that seems to work okay, I assume pulling in CSV data from a Yahoo! 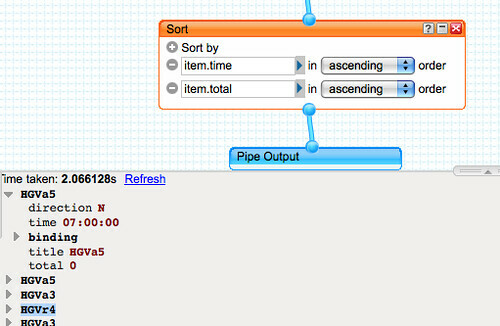 pipe, or DabbleDB database should work too.